Home/Builder’s Advice/Bathroom refurbishment, where to start? 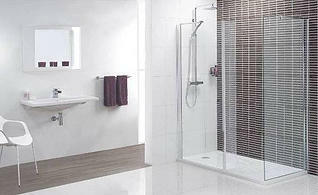 Nowadays, the bathroom refurbishments are planned keeping the wellness and comfort of the user in mind. People should plan to come home to a soothing sanctuary after a long, tiring day. Despite this evolving trend, comfort doesn’t outweigh functionality. A bathroom refurbishment should be planned well enough to provide adequate storage and sufficient space, after which you can create the relaxing atmosphere you have in mind. Nowadays, bathroom can be located almost anywhere around the home. From en-suites in loft conversions, to fully functional bathrooms in lower ground basements with adequate structural waterproofing. Whether you’re considering refurbishing certain aspects of your bathroom or going for total refurbishment from scratch, realise that a great deal of planning will go into this process. Set aside sufficient time to ponder over what exactly you’re looking for, as this fore thought will determine the refurbishment layout, material choices, and décor. In addition, use the order listed below to prioritise and categorise your preferences, as this is the arrangement that your building contractor will use to schedule their work. • Laying out the tiles. • Setting up lighting, fans and ventilation. • Replacing stud walls and tile backing boards and possibly drywall on the ceiling as well. • Replacing the sink fixtures, vanity and relevant items. • Finally, painting and adding finishing touches. Depending on the ideas you have for your bath, refurbishment from scratch usually requires altering the plumbing. Nevertheless, if your plan allows room for slight alterations that leave the core plumbing untouched, it’s recommended that you opt for this route. As plumbing is going to add significant costs to the project, keep this mind wherever possible. Once you’re past the planning phase and are in the process of procuring the materials, it’s important that the materials arrive on time to suit your schedule. If you happen to be particularly picky, you’ll have to wait for the supplier to procure the hard to find materials. If this happens to be the case, the order placement would fall under the schedule you have in mind. Its better to wait for quality items that suit your taste, than to order quickly to satisfy the timeline of the building contractor, and if your building contractor is competent, they will put your needs 1st and be willing to allow for this lag in time. Nothing says good morning better than abundance of natural light flooding in the initial hours of the day. Under most house plans, baths are assigned a spot with the least amount of air circulation and natural light flowing in. Refurbishment is the best possible time to enhance the ambiance of the bath; you can accomplish this by increasing the window size and installing a skylight or sun tunnels. your consideration. If you’re not really a fan of taking a dip in the tub and feel your bath could use its space more practically, then this type of shower is the best. Plus, a good set of sliding doors prevent the water from spraying all over the place and the absence of tub makes the bathroom feel more spacious.